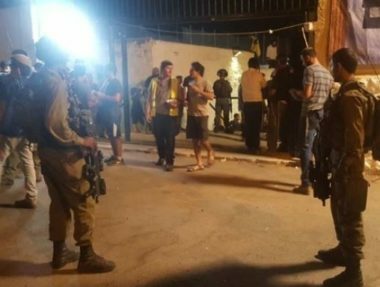 A group of illegal Israel fanatic colonists invaded, on Tuesday, a Palestinian home, in the Old City of Hebron, in the southern part of the occupied West Bank, and threatened to kill the entire family. The home owner Emad Eqneibi said the colonists demanded him to leave his property so that they can illegally occupy and annex it, and threatened to kill him and his entire family if he does not leave. Dozens of Palestinians, including members of Fateh Movement in the Old City and nonviolent activists against the Annexation Wall and Colonies, rushed to the property, and vowed to do whatever it takes to protect the family and their home, in coordination with the local Committee against the Annexation Wall and Colonies. In related news, Israeli colonists attacked Palestinians in the Shuhada Street, in Hebron, before the soldiers rushed to the area, removed local nonviolent activists, who were documenting the invasion, and declared it a “closed zone” to all Palestinians. 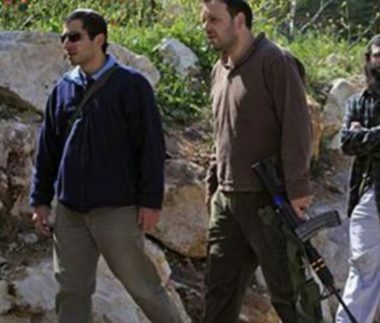 Ezzat al-Karaki, a local nonviolent activist with the Youth Against Settlements nonviolent direct-action group, said the escalation by the soldiers and the colonists will not deter the locals from documenting an exposing Israel’s constant human rights violations. Local human rights activist Issa Amro said that he has received many threats from the army and the “Civil Administration Office,” vowing to abduct and imprison him, for his role in forming a local civil protection group, and added that he, along with many international peace activists, and locals, have been repeated assaulted. He added that he also received phone call in Hebrew, threatening to kill him, and to assault anyone who resists the colonialist activities, and these escalating violations. After Israeli recently kicked the Temporary International Presence in Hebron (TIPH), and other observers from the Hebron, the locals formed a committee to protect the locals and document the Israeli violations.